least once a week my rice pot boiled over, I decided to give it a try. breakfast oatmeal. Add sugar, butter and vanilla. Stir and serve. Almost everyone has time for that little bit of fuss on busy mornings! Amen! We are almost a two rice cooker family right now! LOL! Because, paired with a slow-cooker, dinner is on the table hands free and when you are able to get to it! (As Mummy to a 10 month old, I know how precious that is). Using (probably old) short grain white rice in my rice cooker, I use 5 cups of rice to 9 cups of water and it comes out just right. However rice cookers vary a bit too. My old rice cooker took 5 cups of rice to 10 cups of water. Here’s something to read with some ratios: http://www.ehow.com/how_4609434_nostick-brown-rice-rice-cooker.html Once you figure out your amounts, you will be golden! Thanks! We just received a referral for a baby boy from Ethiopia AND I am pregnant about 17 weeks, so adding two more children to our family this year I know I want to use this thing regularly. I will try again! Oh! It DOES cook brown rice as well as white? That’s why I’d always resisted getting one: because we eat brown rice much more often than white rice. that was my problem – there are really different amounts for brown rice versus white and the directions for ours aren’t so clear… Mary, any advice?? I have two – a big one and a little one. And to answer the other questions – ignore your owners manual if necessary. Put rice in cooker, add water to the corresponding line on the cooker (1 scoop, water to line “1”, possibly a teensy bit extra water for brown rice). Turn on. Brown rice will cook, even on the white rice setting, it will just be a bit chewier. Easy peasy! I just recently got one and I love it. I cook jasmine rice most of the time. I put in the scoop of rice, wash it till the water is almost clear, then I fill it up with water to the corresponding 1 in the pot. I let it soak for about 10-15 minutes and then plug it in and set it to cook. The rice has been wonderful! Now, I just wish there was a bean cooker to make cooking dried beans as easy. We lived in Korea for a year, and used it almost every day! I love them, for white, brown, short grain, long grain. We have one that has a timer and it is perfect for steel cut oats hot and ready in the morning. Yum! I have a cheapo rice cooker, I believe it cooks up to 4 cups of rice. No more than 20 bucks. It has lasted years. The one before it was also cheapo and only died because it was packed wrong and got banged up in transit when I moved. I love my rice cooker. I normally start up the rice, throw in a bunch of herbs and let it go. By the time the oven has preheated for the fish I normally pair with it the rice is almost done. I like to add some Parmesan cheese and a pat of butter, just a touch of salt to taste. So very good. We use ours every day, and leave the warm rice on the counter for lunches or a side dish at dinner. We NEVER measure, but instead follow the advice of our favorite Chinese restaurant owner. Put in the amount of rice that you want. Rinse, rinse, rinse to remove starch. When the water is clear, rest your finger on top of the rice (perpendicular). Fill water to just one knuckle above rice. Less for firm rice, more for soft rice. What great advice! Thank you! I bought a rice cooker recently at a bargain shop (it was only $15, I think), but it’s huge. I think it’s just too big for us, and the rice always stuck to the bottom. I had given up. But you’re giving me hope! Maybe I’ll just buy a smaller one and try again. Thanks for the info re stale vs. fresh, how to measure the water, and how to cook brown! I have been thinking about getting a rice cooker. I’ve eyed a few at the stores but I think I’ll look for one at the thrift store. That way if I don’t like it, I won’t be out much money. I love my rice cooker and use it often My original was not non-stick, and a bit of a clean up problem, but this one is a cinch to clean. Wouldn’t want to be without it. I’m so excited!! I saw your website for the first time last week and the part about a rice cooker being essential in the kitchen. I went to my local Kroger yesterday and guess what I found in the markdown buggy?!? A rice cooker AND a waffle maker! I was in HEAVEN! 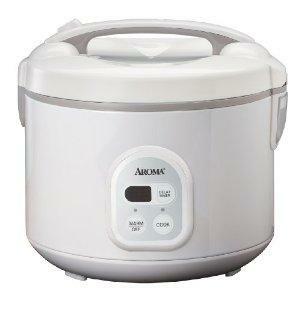 Can’t wait to use the rice cooker – I am grateful to have found your website!